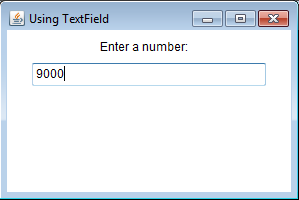 TextField class allows you to create a text field to input and edit a single line of text. 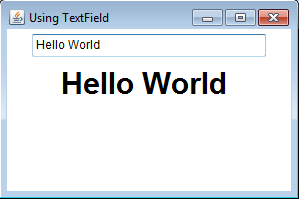 The TextField can generate text event and key event. To receive text event, the application must implements TextListener interface. You will need to override the textValueChanged (TextEvent e) method of the TextListener interface to perform an action when there is any change to text in the text field. You need to use the addTextListener(TextListener listener) method to register the listener to receive the text event. To receive key event, the application must implements KeyListener interface and register the listener.You need to use the addKeyListener (KeyListener e) method. The KeyListener interface has three methods: keyPressed(KeyEvent e), keyReleased(KeyEvent e), and keyTyped(KeyEvent e) that can be used to perform action when a key is pressed, released or typed. creates an empty text field with specifying the number of columns. creates a text field with the default text in in. creates a text box with default text and number of columns. registers the text listener to receive text event from this text field. returns the text in the text field. determines whether or not the text field is editable. For another example, the text field object is used with the KeyListener interface. To allow only number digits, you need to track the code of character input in the keyTyped method. The digit characters are from 0 to 9 and their equivalent codes are from 48 to 57. The consume method of the KeyEvent class is used to hide an undesirable character.